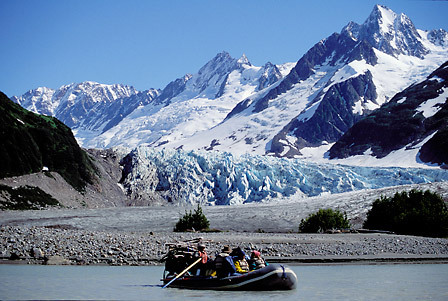 The Tatshenshini-Alsek River Expedition has long been regarded as North America's most spectacular whitewater rafting trip. Bisecting one of the most pristine wilderness areas in the world, these rivers defy the human imagination by cutting through the world's largest non-polar icefields--the seemingly impassable Alsek, St. Elias, and Fairweather Ranges. This 141-mile river makes a remarkable transition from the arid Yukon Territory to the Gulf of Alaska and offers river travelers a sublime wilderness experience. "We can't thank you enough for a truly memorable trip. We haven't talked about much else since we've been home. Of course the bears and the icebergs get bigger and bigger with each re-telling of our stories. Please convey our thanks to Tommy and John. You always have absolutely wonderful river guides! Competent, knowledgeable, engaging personalities and perfectly at ease in every situation. And Julie of course is just the best, what a wealth of information. The Marsh Fork of the Canning is one of the fabled rivers of the North Slope. Running due north out of the Romanzoff Mountains, this glacial, spirited beauty cuts through the heart of Alaska's Serengeti: a wildlife refuge of the first magnitude. Remote from human influence, the 19-million-acre Arctic National Wildlife Refuge is host every summer to the calving and migration of 175,000 caribou. This trip provides a remarkable opportunity to descend from the high mountains to the coastal plain. A flexible daily itinerary enables us to paddle our rafts and then enjoy layover days for hiking, fishing, and photographing to our hearts' content. Days are long, sunsets endless and nights ablaze with stars and Northern lights. In mid summer, the Arctic is in transition. We will pass through a visual tapestry of autumnal splendor. Encounters with caribou, Dall sheep, grizzly bear, wolf, fox, peregrine, gyrfaclon, snowy owls, and muskox, heighten the drama of this journey. This trip is being offered as an exploratory with all the joys and challenges that derive from expeditions of this nature. Since 1976, we have operated all of our Alaskan trips as explora-tories with our clients. Our crews relish the opportunity to share a new river with like-minded adventurers! 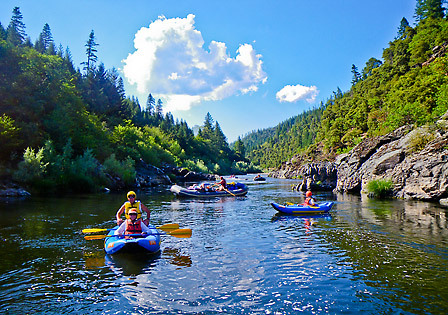 The Klamath is one of California's most exquisite rivers. Cutting through a stunning, precipitous canyon of conifers and rushing crystalline side creeks and waterfalls, this jaunty river drops, cavorts, and glides through casual riffles, restful pools, and bouncy rapids that require the deft maneuvering of paddleboats and inflatable kayaks. The Klamath supports a rich diversity of wildlife including blue heron, osprey, bald eagle, river otter, deer, and black bear. The warm water, playful rapids, and lush side canyons, make this an ideal river experience for adventurers of all ages. "I had the time of my life and can still feel the rapids. Haven't put on my watch yet either. I've got a new motto: Life is just something I do between river trips."